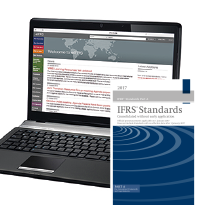 The 2017 IFRS® Standards (Blue Book) is now available to access online for subscribers through eIFRS Professional. This is the only official edition of the consolidated text of the authoritative pronouncements as issued by the International Accounting Standards Board required for the financial year beginning on 1 January 2017. What are the main changes in this edition? If you would like to be the first to order a printed copy and to find out more information about its content please visit our IFRS Shop where you can register your interest. You will be the first to be contacted upon its release in January 2017.
eIFRS Comprehensive Subscribers will automatically be sent a copy in January. If you would like to purchase an eIFRS Comprehensive or eIFRS Professional Subscription, please visit our IFRS Shop where you can place your order.